A report (Org Process Res Dev 2014, ASAP article) out of Jamison’s group at MIT, provides a 3-step synthesis of Rufinamide in 92% overall yield. The process illustrates a continuous and convergent method, moving away from the isolation of a key organic azide intermediates and a Cu coiled-tube reactor for the cycloaddition reaction to the corresponding desired triazole. I’m not sure if it was in the generic scheme of the reactions performed, the authors of the work or the title translating microwave methods to flow that got me: truth is it was a bit of all three in a recent publication (Beilstein JOC 2011). The scheme had a para-nitro diaryl ether, which for me means an amine handle with multiple substitution patterns on both rings — reliving my sorafenib days at Bayer ( I did a lot of Ullmann reactions, uugh, although the microwave did prove handy!). 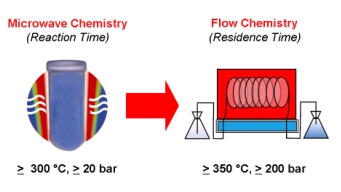 The authors of course are front and center of the flow chemistry community and lastly there have been a number of papers taking microwave methods and transferring them into flow methods — and I do believe we will see more of these. It’s meaningful and there are advantages to both. Although I found an example in the literature in moving from a microwave method to a micro-reactor method – and placed it in my synthflow resource blog, it should also be placed here — there are advantages born out in each technology depending on the application. To give yourself something to think about, and there are going to be several more publications using this theme, follow the paper described.